As I write this it’s a gorgeous 79 degrees and sunny, there’s a light breeze, and very low humidity. I’m sitting by an outdoor pool that is fully functional — the water is not solid and there are humans splashing around in it — and the nearby plants and trees are all green and blooming. Obviously I’m not in Happy Valley. I’m just north of Orlando, Fla., in the community of Heathrow, where I attended the wonderful outdoor wedding of an old friend (congratulations Richelle and Paul!). Now that the festivities are over I’m reading online and catching up on all the excitement I missed this weekend in Pennsylvania before I leave for my flight back north. That’s right, I missed March Matness. I was not in Pittsburgh watching the Penn State wrestling team win its eighth NCAA team championship in nine years while also crowning three individual NCAA champions. Think about that – eight national team championships in nine years. I won’t try to find words to describe that level of accomplishment because for most of us it’s incomprehensible. For a team to not only be the best at a certain skill, but then to maintain that skill level year after year when everyone else is focused on just knocking you off… Words do not do that justice. 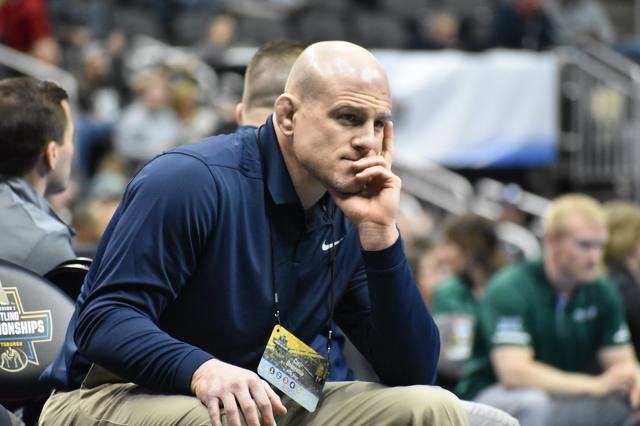 And we all know the man responsible for this achievement is Coach Cael Sanderson, who was named Penn State’s head wrestling coach on April 17, 2009, and in the ensuing 10 years has led what could arguably be called a renaissance in collegiate wrestling in this country. As I was going through all of the news reports and online videos of what happened I came across the coach’s press conference that took place before the national tournament started. Coaches Tom Ryan (Ohio State), Tom Brands (Iowa), John Smith (Oklahoma State), Keith Gavin (Pittsburgh) and Sanderson were seated at the dais and answered a number of questions posed by the reporters. “…But I think wrestling, we're more on the other side where we should be fighting for more than 9.9 scholarships. We have 10 weight classes. I don't know why that isn't brought up more. But this tournament, sold out. You can't get a ticket here. Dual meets are growing. The popularity in the sport's growing. We should be getting more scholarships. That would be in the best interests of wrestling, yeah." Here we have a man who is considered the most dominant collegiate wrestler in NCAA history. In four years of competing he never lost. He won four individual national titles and each time won the Most Outstanding Wrestler award at those championships. His four-year streak of perfection was called the No. 2 most outstanding achievement in collegiate sports history by Sports Illustrated. And to top it off, after college he went on to win a gold medal in the 2004 Olympics in Athens, Greece. I think it’s safe to say this man knows wrestling, especially collegiate wrestling. And what that man is saying, first and foremost, is that wrestling needs more than 9.9 scholarships. And what he’s also saying is he doesn’t know why that need isn’t talked about more. When arguably the greatest wrestler in American history, who's also on an amazing run of success as a head coach, says that something which would make wrestling better isn’t talked about enough, then every red-blooded wrestling fan in this country ought to start talking about it. We don’t need to agree with it, but we ought to heed his advice and bring it up every chance we get. For my money I agree with Coach Sanderson and have said so on this website several times in the last few years. And since Coach Sanderson suggests we talk about it more, then I’m going to do my part now to see that happens. FBS football teams get to distribute a maximum of 85 scholarships. That means everyone on the first, second, third, and most of the fourth string can receive a full scholarship. Men’s basketball teams get a maximum of 13 scholarships. That means the first, second and most of the third string can receive full scholarships. Women’s basketball teams get a maximum of 15 scholarships. That means the first, second and third strings can receive full scholarships. But the men’s wrestling team gets a maximum of 9.9 scholarships. That means not even the entire first string can receive a full scholarship. The NCAA’s mission, or most significant activity as described on their federal tax returns, is they are dedicated to the well-being and lifelong success of college athletes, and united around one goal: creating opportunities for college athletes. Except, it would seem that they are dedicated to the well-being and lifelong success of some college athletes more than others, and willing to create opportunities more for those athletes than they are for others. Wouldn’t increasing the maximum allowed scholarships for wrestling to 25 or 30, enough to cover the first, second, and most or all of the third string, create opportunities for more college athletes and provide for their well-being? I’ll answer the question for you – it would. A quick aside here so that no one thinks I’m forgetting about lacrosse or swimming or track or all the other NCAA sports. I’m a believer that they deserve to have their scholarship maximums increased, especially men’s and women’s soccer. For the purpose of this column, the focus is wrestling. Now, should there be any doubt about where the popularity of Division I collegiate wrestling is heading, you’ll have the opportunity to see in the next two weeks. On April 6-8 that other “March Madness” college sporting event culminates in the Final Four at U.S. Bank Stadium in Minneapolis. That stadium is the home to the Minnesota Vikings and seats 66,200 people. In the past, when the Final Four has been held in vast football stadiums, the court has been placed in one end zone and seats closer to the opposite end zone were not sold. Not this year. According to the stadium’s seating chart the basketball court will be placed on the 50-yard line. Well, guess where next year’s NCAA Wrestling Championships will be held? None other than that exact same U.S. Bank Stadium. And according to the seating chart, the mats will be spaced all around the entire football field and use the seats all around the stadium – meaning there will definitely be a new attendance record for the NCAA Wrestling Championships next year. So NCAA, lets change this unfair policy. Add another 15-20 scholarships to your maximum limit for wrestling, live up to your mission, and create opportunities for lots of additional college athletes. And if you are a wrestling fan, make sure you talk about this whenever you can! 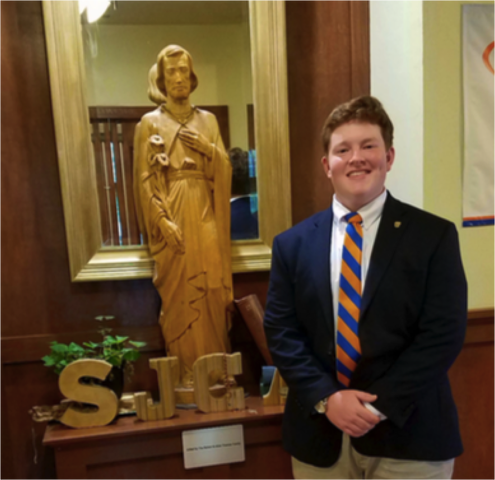 A Saint Joseph's Catholic Academy student is a finalist for the prestigious National Merit Scholarship Program, placing him in an elite group of high school students from around the country. Senior Jason Thomas is among a nationwide pool of finalists representing less than 1 percent of U.S. high school seniors.